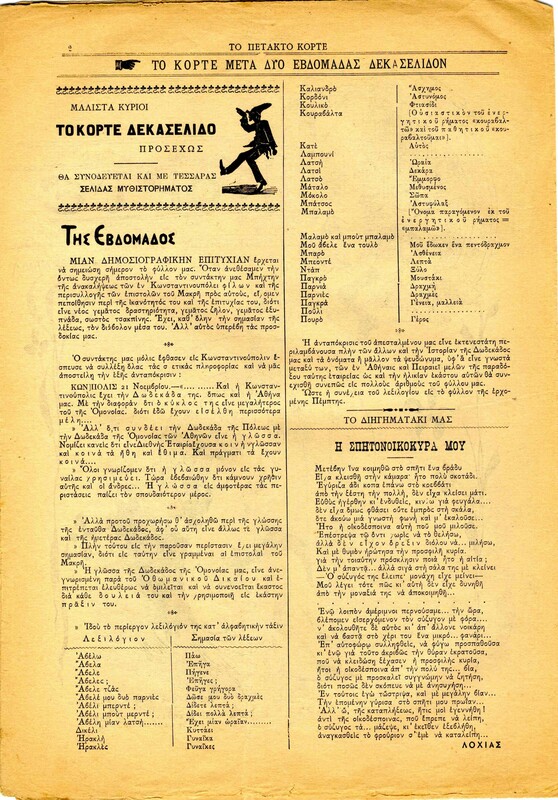 I just noted that Nikos Sarantakos posted on his blog a report on the 1904 attestation of Kaliarda. I neglected to mention that he posted a full scan of the 1904 article (1904–11–25), which includes a couple of paragraphs left out in Spatholouro’s transcription, which I’d previously posted here. I have no idea who Makris was, and what his correspondence involved, but there may be hints of it in previous issues of the magazine. Why yes, some of those italics are deliberate. The whole magazine did that, not just this article. The reference to the Twelve, this confirms, is purely conventional (“Council of Elders = Queers”), since in fact there are numerically more queers in Istanbul than Athens. Again, the explicit identification of Athens Lubinistika from 1904 with Istanbul Lubunca; and the old Italian vocabulary which differentiates the two is not included in the glossary. And indeed, while the following issue (1904–12–02) is missing from the Greek National Library and the ΕΛΙΑ press archives, the issue after that, 1904–12–09, did publish names of the “Twelve in Peiraeus”; I already noted the presence of masculine, feminine and neuter names, in contrast with the exclusively feminine names reported for 1971 by Petropoulos. The 1904–12–16 issue left out its report on “The Twelve” for lack of space; the issue after that, 1904–12–23, is likewise missing from ΕΛΙΑ. The 1904–12–09 issue likely has a few more gems though. Μάλλον λόγω σεμνοτυφίας, η ΑΤΛΑΝΤΙΣ ευπρέπισε το πρωτότυπο κείμενο της εισήγησης του Νικ. Λάσκαρη στον Καλοκαιρίνειο Διαγωνισμό. Η αθηναϊκή εφημερίδα ΑΘΗΝΑΙ στις 5/6/1925 δημοσιεύει επακριβώς το κείμενο της εισήγησης, όπου το παράθεμα που μας ενδιαφέρει είναι το εξής: «Η πάγκαλος ελληνική γλώσσα αντικατεστάθη διά των αργκό των χασισοποτών και της άλλης βρωμεράς διαλέκτου των πυγοστόλων νεανιών των περιφερομένων κατά τας νυκτερινάς ώρας επί της πλατείας της ομονοίας και υπό τα βαθύσκια φυλλώματα του κήπου του Ζαπείου».